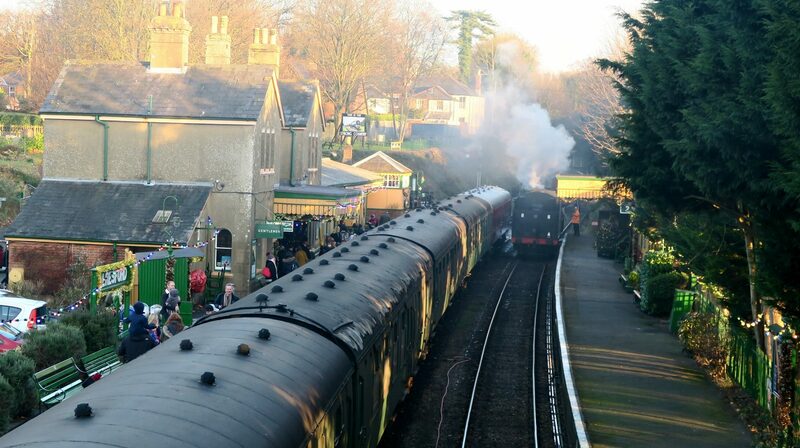 I have been a fan of the Watercress Line traditional steam train since I was a little girl. I have fond memories of going along to the station with my Mum and Dad, and standing on the bridge overlooking the train roof, waiting for it to go underneath me. Well this weekend I got to do this with my family. 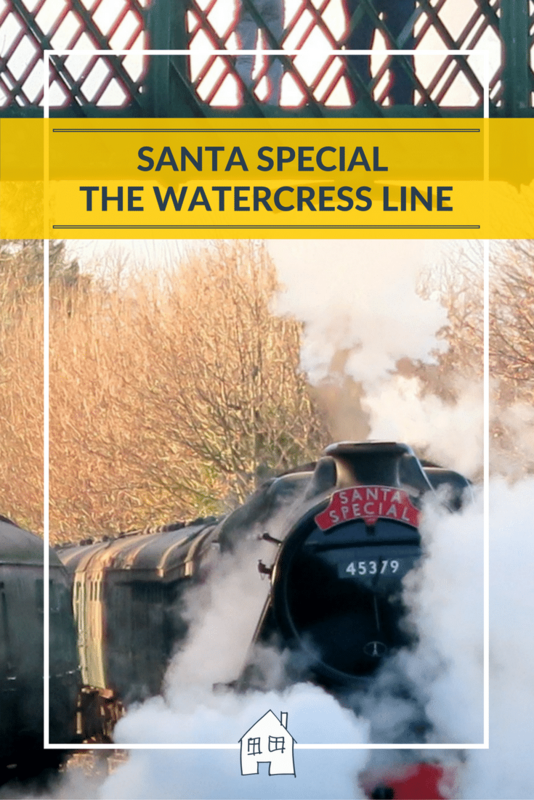 We were invited along to their Santa Special on the Watercress Line steam train, a traditional steam train, with bouncy springy seats, and wooden slamming doors, you couldn’t get more magical. 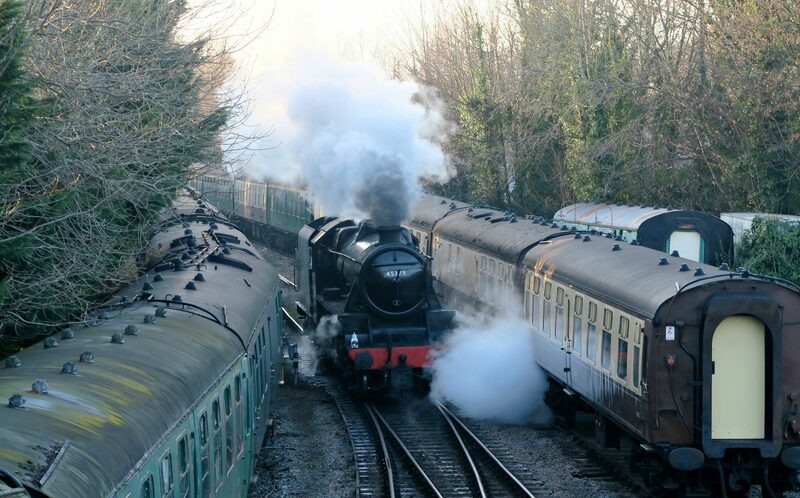 From the moment you arrive at the Watercress Line, it is like stepping back in time. The old waiting room, the ticket office and traditional dressed station staff. 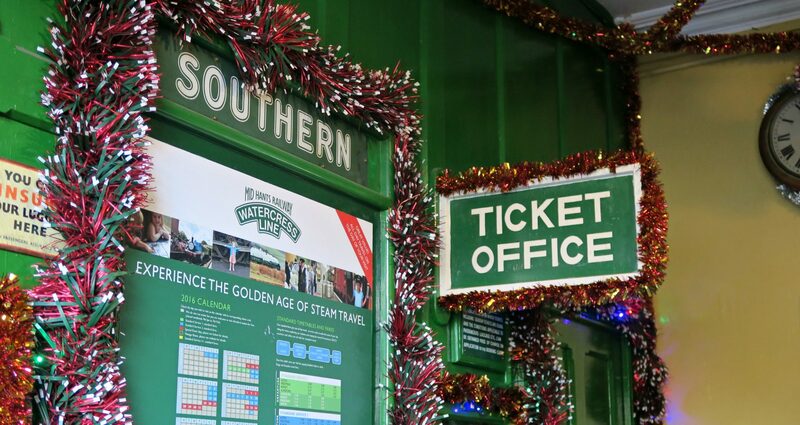 The Watercress Line have decorated the station with lots of Christmas tinsel and festive cheer, even the carriages inside the train is filled with decorations too. 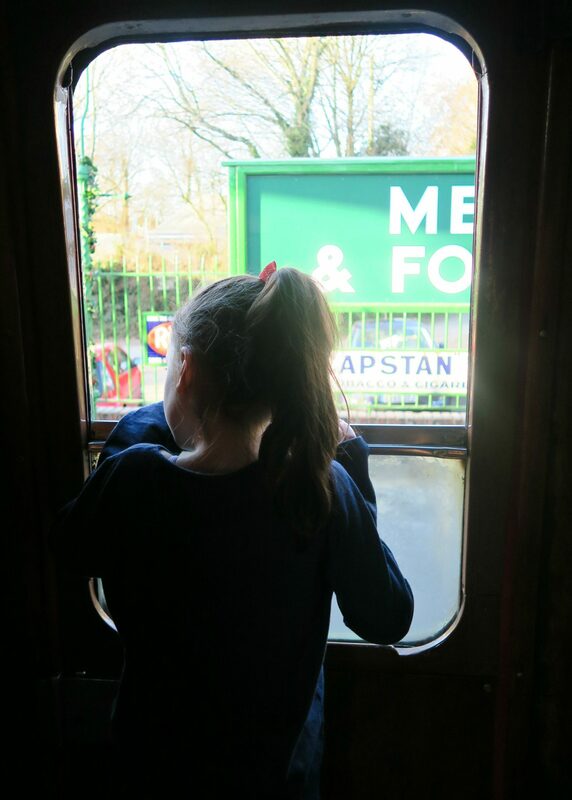 The kids eagerly waited on the platform for the train to arrive, the twins have never seen a proper steam train and Lily was a little taken back by it to start off with! 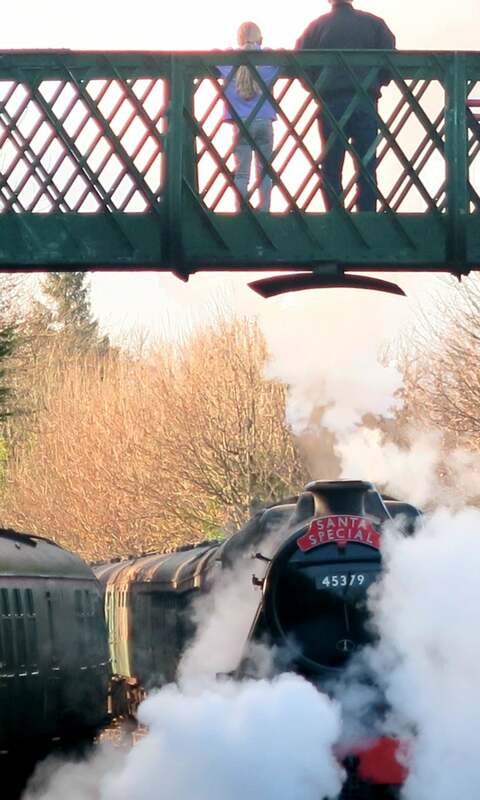 With the big engine, lots of steam puffing out, but she soon changed and couldn’t wait to get on. 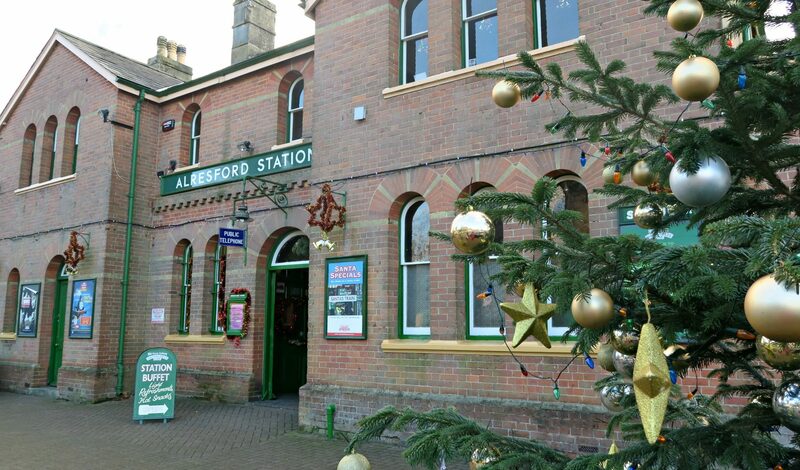 There was a lovely atmosphere on the platform, with lots of children bursting to get on the Watercress Line train, the station staff were great and helped to keep the children excited and joining in with the fun. 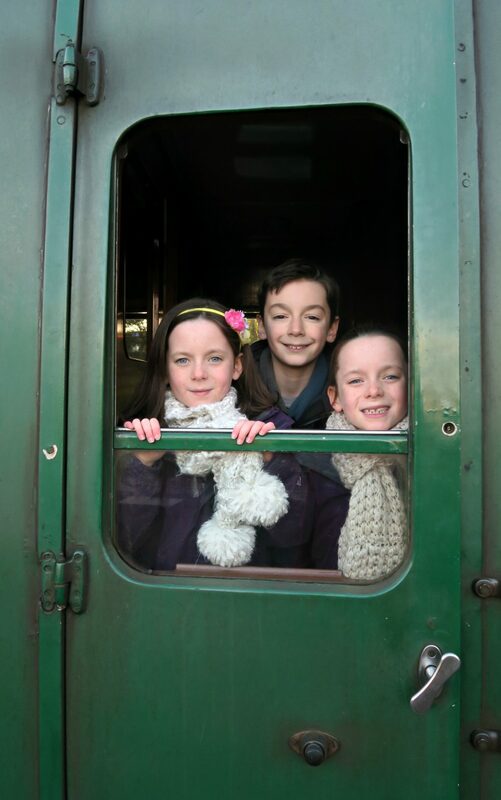 My traditional thoughts of a steam train, is hanging out of the train window, so we quickly got a photo of them doing this…..should have got them waving out of it, like the Railway Children. With a slam of the wooden doors, we jumped on, and walked up the aisle finding our seats. The sitting down on the bouncy seats, with all the springs in, and waited to see what happened next. Then along came the Elves! With some very ‘funny’ Christmas jokes, that went down well with the kids, although they could do with expanding their joke book!! 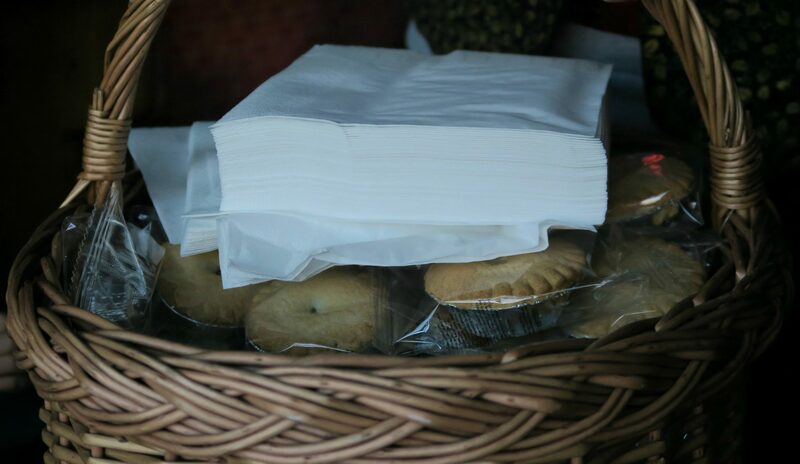 Included in with your ticket, is a drink of orange juice or white wine, and a mince pie for the adults. The kids eyed these up, and didn’t get one, so I would suggest bringing your own snacks for them. It is mentioned on the website about this, but I missed it. The kids get a choice of a carton of apple juice, or blackcurrant. 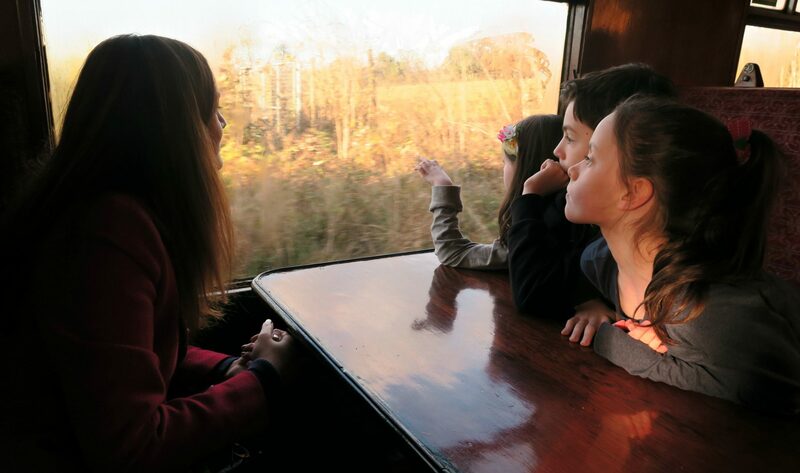 We enjoyed looking out the window at the views, it is such a lovely part of Hampshire, and with a sunny day like we had, we couldn’t have asked for much more. 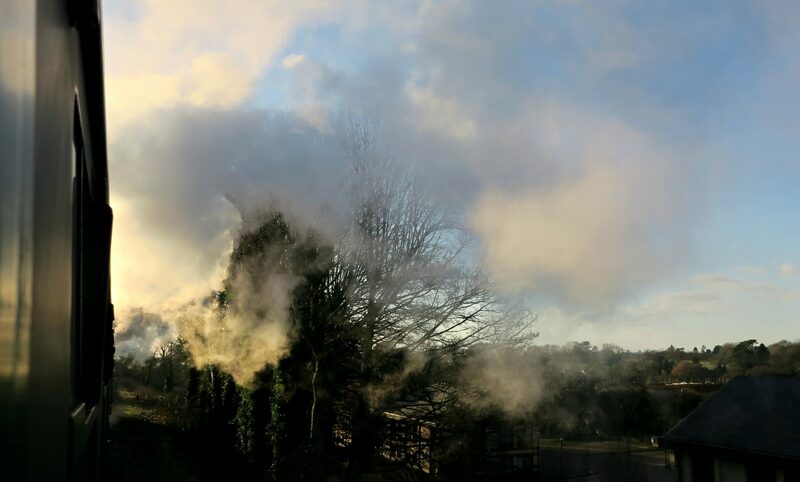 We were able to watch the steam from the train puffing into the air, and even had a little look out the window at the station. The train ride is approx 1 hour long, and we had a visit from Father Christmas quite early on. He said Hello to the children, and with the help from his elves he handed out their presents. See that face on Sofia, she said afterwards that she was just very excited!!!! 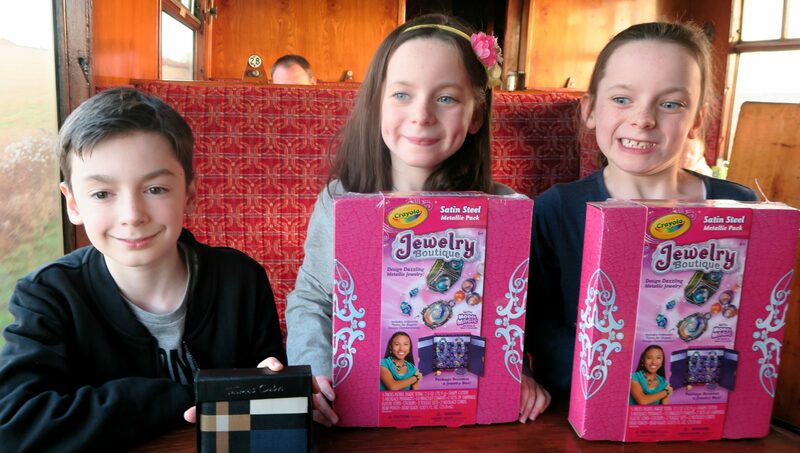 The presents were lovely, my girls were chuffed with their craft set, and Tyler was over the moon with his smart nice wallet. Something really nice for a 12yr old, and not at all babyish. 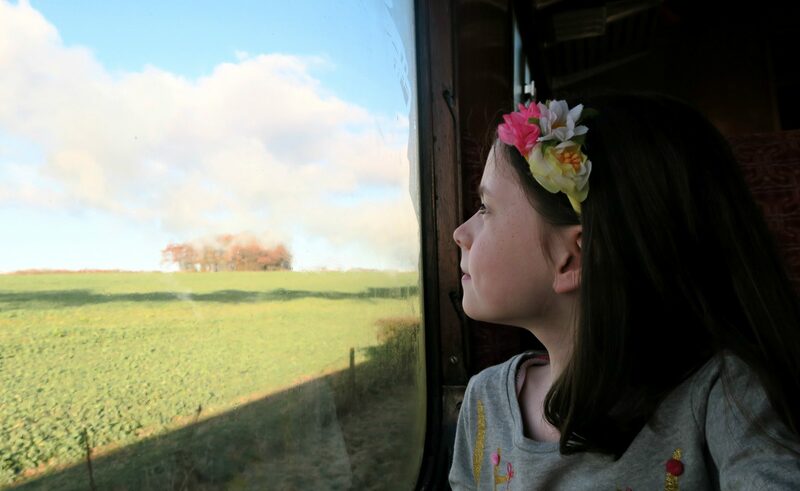 This is Lily spotting Father Christmas when he came back again near the end of the train journey. This time, we were able to have a proper photo taken with him. 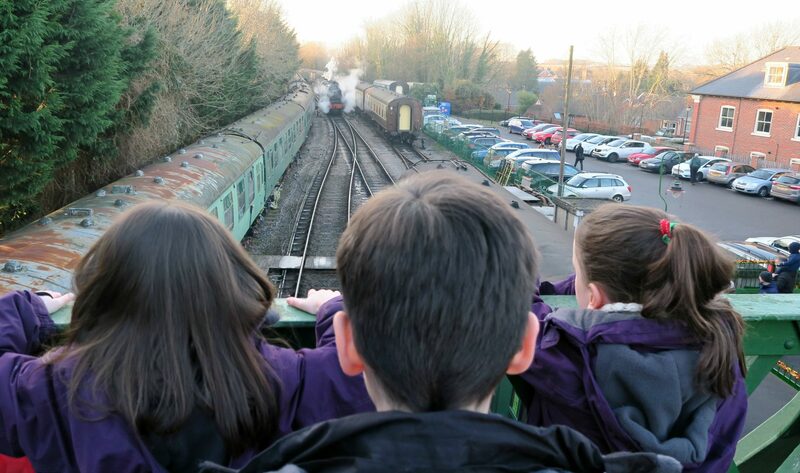 My only suggestions to the Watercress Line, is if they could give the children something small to do whilst on the train. It was quite a long time for them to wait, and I hadn’t taken anything with me for them. Some colouring would have been great! 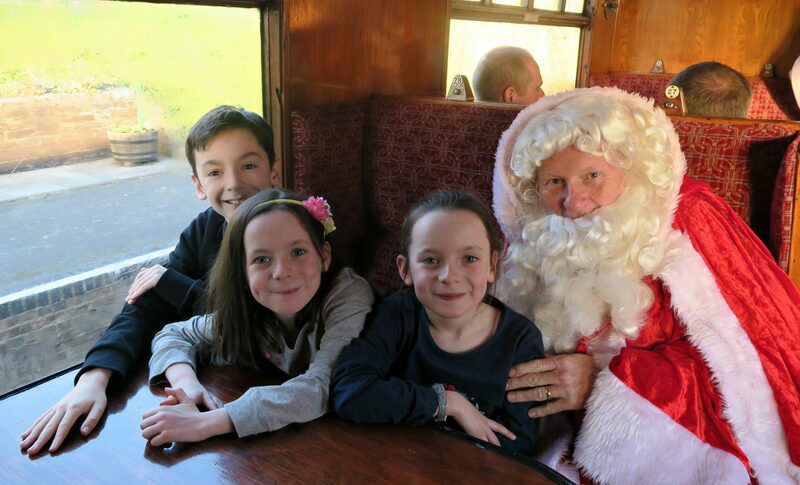 The Elves did come along and sign to them at the end, which the kids did enjoy but of course they have the full train to work along and sign with! Once we arrived back in the station, we quickly got up on top of the bridge to take a look at the engine end of the train, and to see how large it really was. What they didn’t realise was that the steam train was going to go straight underneath them, and cover them in all the smoke and steam!! They loved it, and I would suggest doing it with them!! 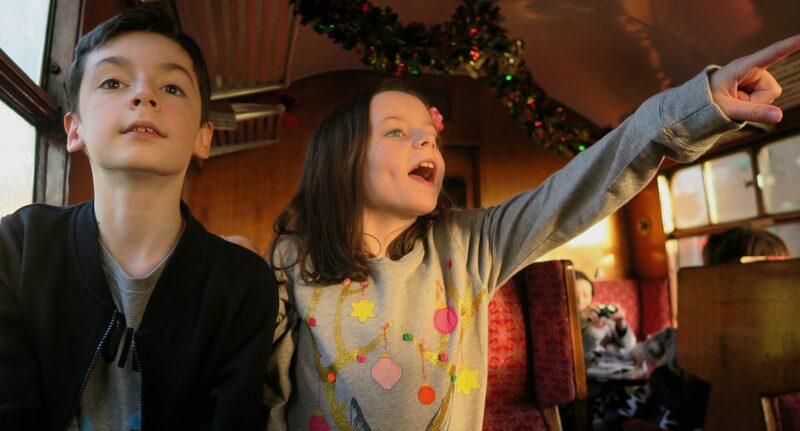 I think for a Santa Special the price is quite good, the kids love the train, and the presents from Santa were really nice. 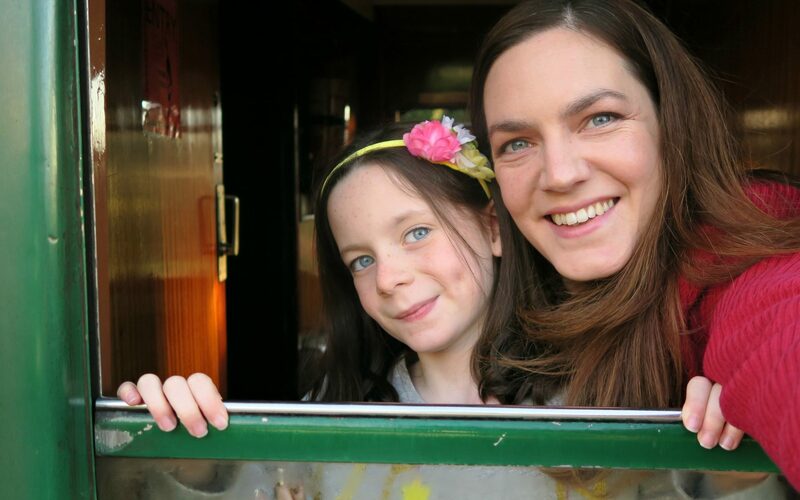 This would be a lovely one to do with Grandparents too, as they would really enjoy the train. 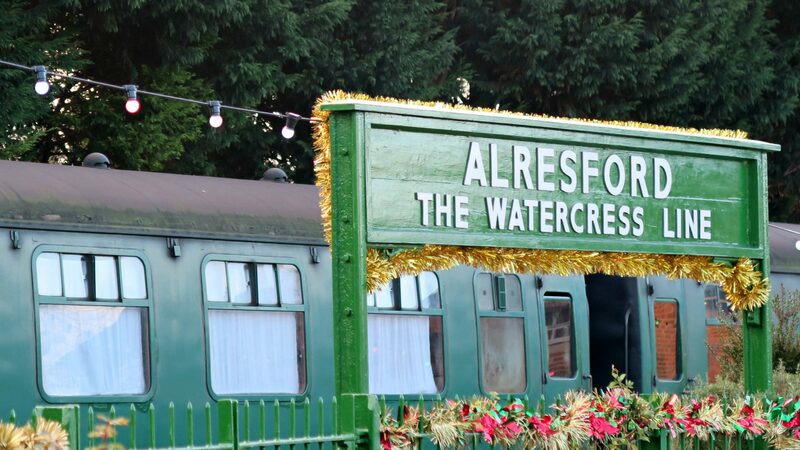 The following fares for the Watercress Line in 2016 are, 3rd, 4th, 10th, 11th, 17th-23rd December Adult – £18 Child aged 1 – 16 years – £18 Baby under 1 year – £10 24th December Adult – £19 Child aged 1 – 16 years – £19 Baby under 1 year – £11 Please take a look at my little video to get a feel for the day. *We were gifted our tickets for the purpose of this review, however all words are honest and of my own. This looks so lovely! 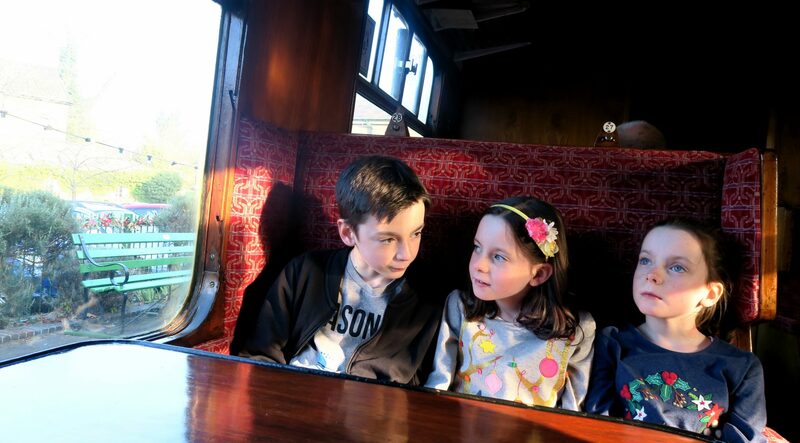 It’s a running joke in our house, everywhere we go we end up at a steam railway, I’ll have to add this one to my list! 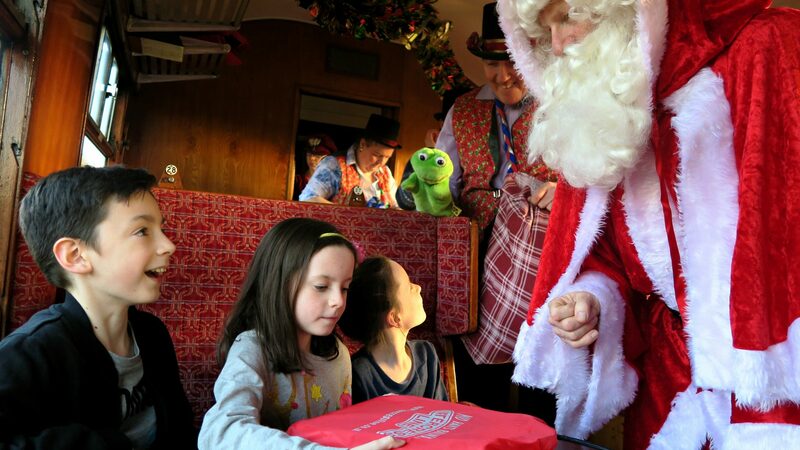 Trains and santa – my 3 year old would have been in heaven! Oh it’s pricey, isn’t it? Especially for adults considering they are only accompanying the kids. 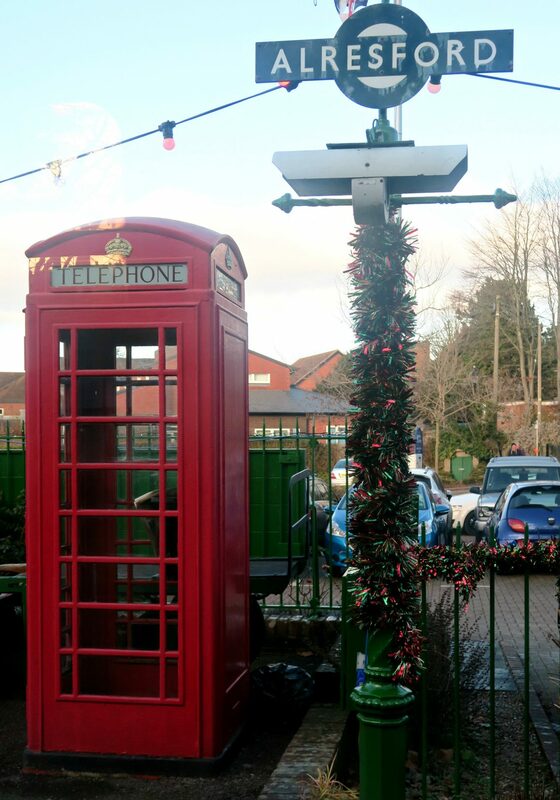 It does look wonderful though and the presents were pretty awesome kind of writes off the price! Their little faces! !